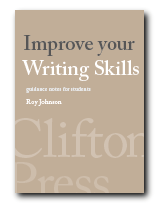 Improve your writing skills – now! Improve your English and your communication skills. Learn how to write with clarity and style. Choose the most effective vocabulary. Make every word count with clear grammar and punctuation. This eBook will show you how to write effective sentences and paragraphs, plus how to structure your writing. Overcome writer’s block. The PDF format can be used on laptops, mobiles, and workstations. Suitable for anybody writing reports, essays, business proposals, memos, or professional documents. You can add your own notes and live hyperlinks to personalise your eBook and make it even more interactive. Amazingly good value. Forty years of writing experience is packed into this full length book for the price of a cup of coffee!